World Cancer Day is a day to unite in the fight against cancer. Every unity band worn, every pound donated and every gesture of support, will play an important part in beating cancer sooner. 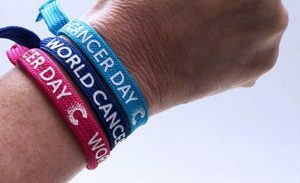 At Toner Cartridge Shop, we’ll all be wearing our unity bands and we will donate £2.00 for every non-retail packaged (plain boxed) toner cartridge sold on tonercartridgeshop.com. We’ll also send you a unity band with your cartridge! Cancer Ninjas was set up by Mike, a businessman and fundraiser who tragically lost his wife to cancer 2 years ago. Since then, Cancer Ninjas has raised a massive £160,000 for its supported charity Cancer Research UK and is completely dedicated to continuing this great work. We have been involved in various fundraising activities with Mike and Cancer Ninjas. Last year we held a ‘Summer Soirée’ in London where we raised £2500.00. 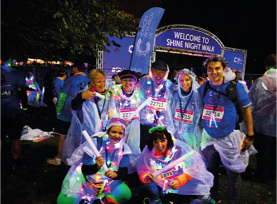 That was easy – drinking, eating, dancing – compared to walking the Shine Walk in September. A half marathon in the pouring rain! It was all worth it though. And the Toner Cartridge Shop walkers (hobblers) raised a further £2668.00. Our fundraising will continue with the £2.00 donation for every plain boxed toner cartridge sold on tonercartridgeshop.com. Our favourite hair and beauty salon, Mudpak in St Pauls, London is joining us in selling the unity bands and you will also find unity bands at the lovely, independent café, Miriam’s Munchies in Harrow. Thank you to all our customers for supporting this vital cause! Remember to purchase your Toner Cartridges on the 4th of February to donate!